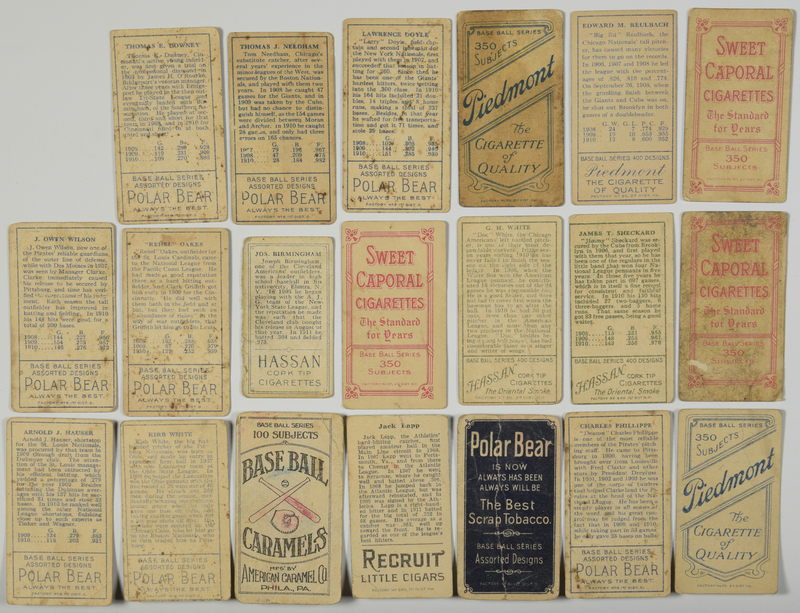 A group of 20 ungraded antique baseball cards, several T-205 and T-206, including Ty Cobb, Cy Young, and a Piedmont Tobacco Card depicting Bill Bernhard of Nashville (Piedmont Tobacco, Factory no. 25, white border, crease across face). 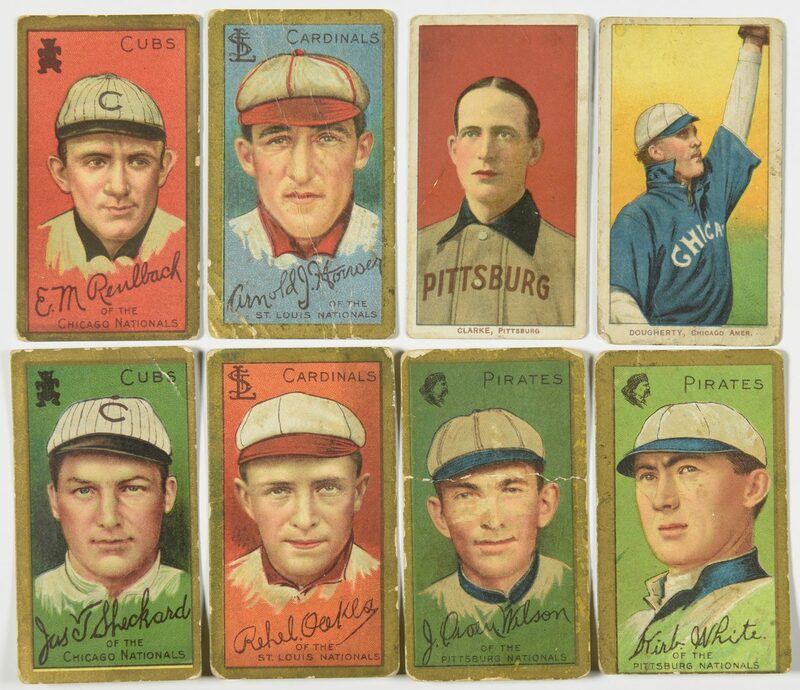 Other Piedmont Factory 25 cards include Big Ed or Edward M. Reulbach – Chicago (gold border) and Walsh – Chicago (white border, significant staining). Polar Bear factory no. 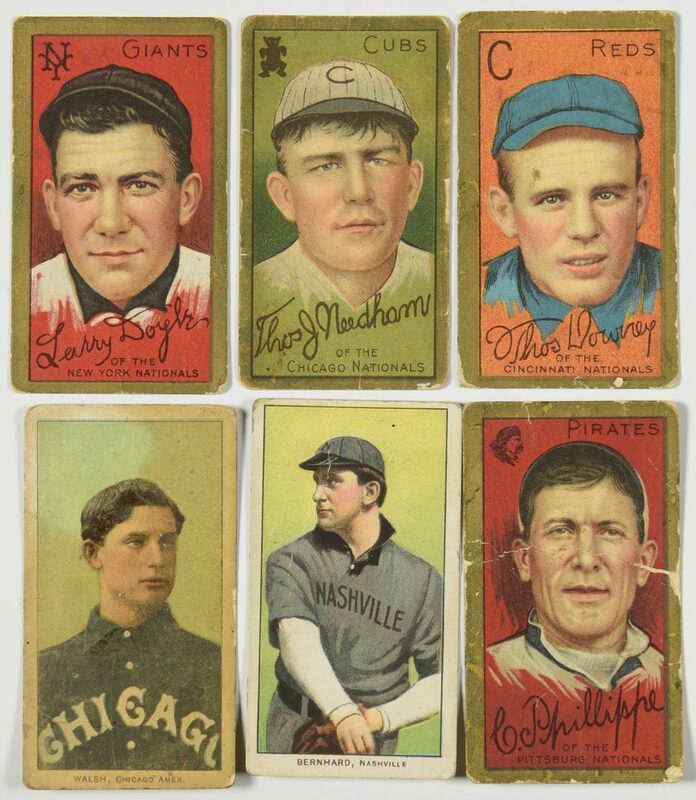 6 cards include Ty Cobb (white border, black back, full vertical crease and corner fold), plus gold border cards for Thomas J. Needham – Chicago, Thomas Downey – Cincinnati, Rebel Oakes – St. Louis Cardinals (fold across lower third), Deacon Charles Phillippe – Pittsburg (fold across face), Larry Doyle – New York, Kirb White – Pittsburg (grime on face), Arnold J. Howser – St. Louis (folded left lower corner) and J. Owen Wilson – Pittsburg (fold across face). Sweet Caporal Factory no. 30 cards, all white borders, include Turner – Cleveland (creases at both top corners). 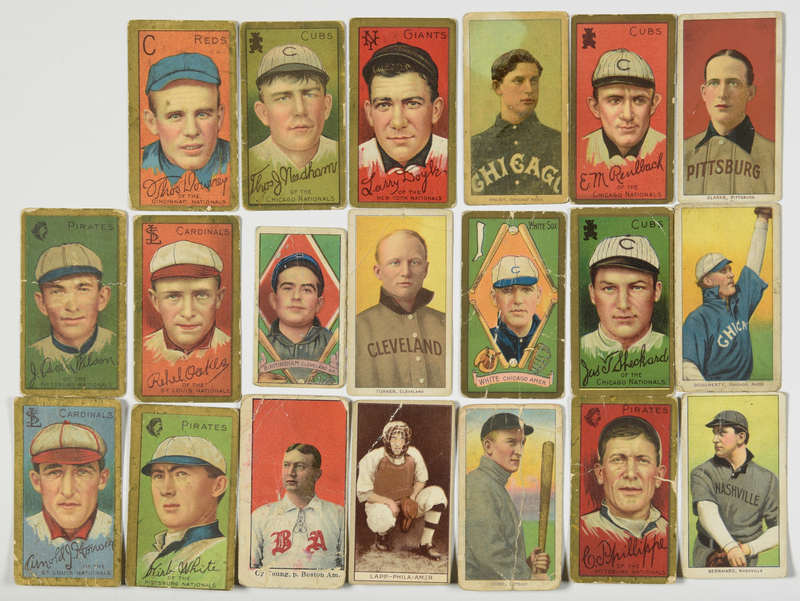 Hassan Cigarette cards include Joseph Birmingham – Cleveland (no factory number, smaller than the others at 2 1/4" x 1 1/8", multiple creases), James T. Jimmy Sheckard – Chicago (gold border, factory no. 649), and G.H. Doc White – Chicago (Factory no. 30, gold border, multiple creases). 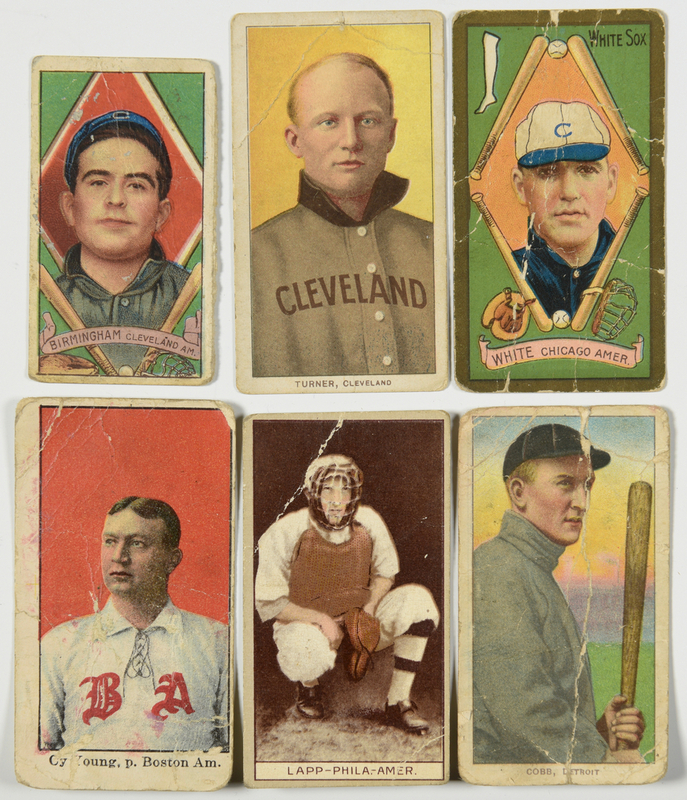 Other cards include Cy Young – Boston (American Caramel Co., white border, some coloring to backside, multiple creases), and Jack Lapp – Philadelphia (Recruit Little Cigars, factory no. 240, fold to upper left corner). CONDITION: All have minor edge wear and handling grime. See description for further details. Ungraded.